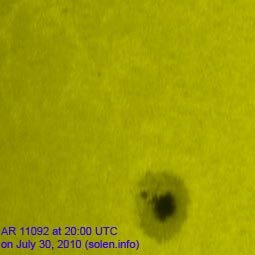 Last major update issued on August 1, 2010 at 04:55 UTC. Minor update added at 15:40 UTC. The geomagnetic field was quiet on July 31. Solar wind speed ranged between 527 and 577 km/s under the influence of a high speed stream from CH415. Solar flux measured at 20h UTC on 2.8 GHz was 81.5. The planetary A index was 6 (STAR Ap - based on the mean of three hour interval ap indices: 6.5). Three hour interval K indices: 21112222 (planetary), 32112211 (Boulder). Region 11092 was mostly unchanged. 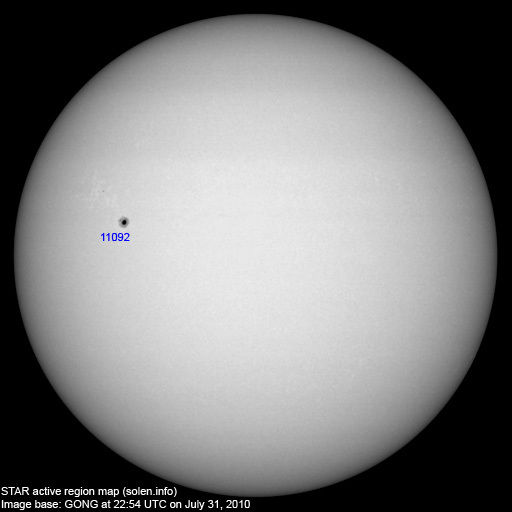 Region 11092 was the source of a long duration C3.2 event peaking at 08:26 UTC. The event was associated with a full halo CME which could reach Earth on August 4. July 29-31: No obviously Earth directed CMEs were seen in LASCO or STEREO images. 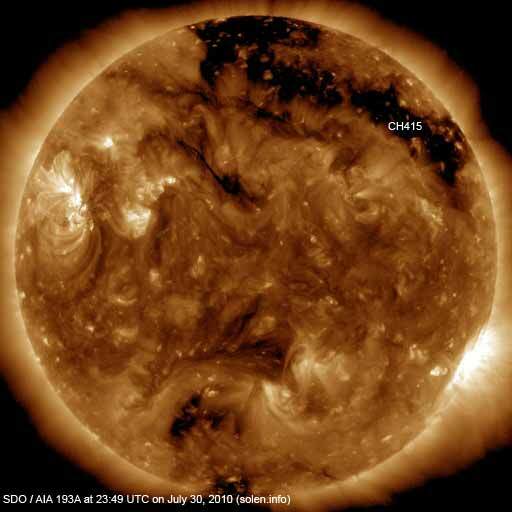 No onvious coronal holes are currently in or near Earth facing positions. The geomagnetic field is expected to be quiet on August 1-3 and quiet to minor storm on August 4-5.